Franz M. Rieger was born on 6 November 1831 in Baden. He was known as Frank in the United States. 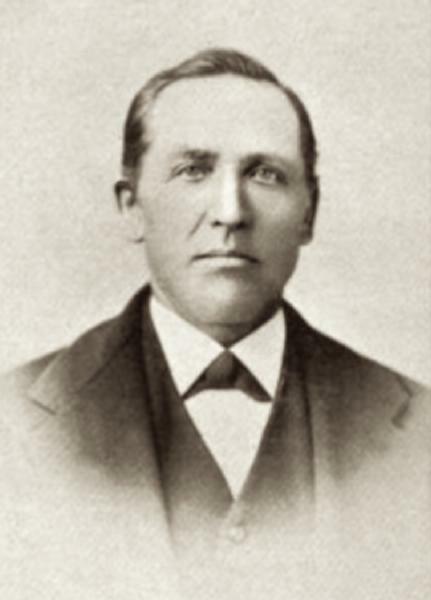 Franz M. Rieger arrived in the United States circa 1854. He married Maria Karoline Regenhardt, daughter of Friedrich Karl Regenhardt and Rosina Plum, circa 1856, and Frank's sister Frances married Caroline's brother Friedrich. Franz M. Rieger and Maria Karoline Regenhardt appeared in the US federal census of 1 June 1860 in Lewiston PO, Niagara County, New York. Other members of the household included Frances A. Rieger, Frank Rieger, Jacob Rieger and Rosalie Nuss. Franz M. Rieger and Maria Karoline Regenhardt, appeared in the US federal census of 1 June 1870 in Suspension Bridge PO, Niagara County, New York. Other members of the household included Frances A. Rieger, Anna C. Rieger, Mary A. Rieger, Herman Martin Rieger and Frank J. Rieger. Also in the household were one female domestic servant and two farm laborers. Franz M. Rieger and Maria Karoline Regenhardt appeared in the New York state census of 1 June 1875 in Niagara, Niagara County, New York. Other members of the household included Frances A. Rieger, Anna C. Rieger, Mary A. Rieger, Herman Martin Rieger and Frank J. Rieger. Also in the household were two male servants. Franz M. Rieger and Maria Karoline Regenhardt appeared in the US federal census of 1 June 1880 in Niagara, Niagara Falls, New York. Other members of the household included Anna C. Rieger, Mary A. Rieger, Herman Martin Rieger and Frank J. Rieger. Franz M. Rieger became a widower at the 4 June 1885 death of his wife Maria Karoline Regenhardt. The following appeared on 6 June 1885 in the Niagara Falls Gazette: Mrs. Rieger, wife of Mr. Frank Rieger who lives on the first farm north of Suspension Bridge, died suddenly from appoplexy on Thursday, in the 48th year of her age. Mrs. Rieger was in her usual health up to the moment of the attack. She and her husband were getting ready to leave on a journey to Michigan when she suddenly dropped unconscious and remained in that state about nine hours when she died. She was an estimable woman and greatly respected by all who knew her. A husband, two sons, and three daughters are sadly bereaved by her sudden and unexpected death. The funeral takes place tomorrow. The following appeared on 26 August 1891 in the Niagara Falls Gazette: The large barn of Frank Rieger, a farmer living just outside the boundary line of the village of Suspension Bridge, was destroyed by fire about midnight last night together with the contents. The fire was first discovered by employes in the frieght yards of the New York Central who aroused the Rieger family. As there was but little water to be had the flames had everything their own way and all efforts were directed to saving the house and carriage shed. These efforts were successful. The barn contained about 400 bushels of unthrashed wheat, 300 bushels of oats, and about 80 tons of hay. All this together with six valuable farm horses was destroyed. Efforts were made to get the horses out but they were unsuccessful, as they were in a partially suffocated condition when first reached, and the flames and dense smoke soon drove the rescuers out of the burning building. The loss will be very heavy, but it is parly covered by a policy in the Farmers' Mutual Insurance Company. The sight of the barn and the entire crop of the season going up in smoke almost drove Mr. Rieger crazy, and he was in a very weak condition this morning. The fire is recognized as the work of an incendiary. The fire department of Suspension Bridge responded, but owing to the lack of water was able to do but little. The following appeared on 26 August 1891 in the Niagara Falls Gazette: The large barn of Frank Rieger, a farmer living just outside the boundary line of the village of Suspension Bridge, was destroyed by fire about midnight last night together with the contents. The fire was first discovered by employes in the freight yards of the New York Central who aroused the Rieger family. As there was little water to be had the flamees had everything their own way and all efforts were directed to saving the house and carriage shed. These efforts were successful. The barn contained about 400 bushels of unthrashed wheat, 300 bushels of oats, and about 80 tons of hay. All this together with six valuable farm horses was destroyed. Efforts were made to get the horses out but they were unsuccessful, as they were in a partially sufocated condition when first reached, and the flames and dense smoke soon drove the rescuers out of the burning building. The loss will be very heavy, but it is partially covered by a policy in the Farmers' Mutual Insurance Company. The sight of the barn and the entire crop of the season going up in smoke almost drove Mr. Rieger crazy, and he was in a very weak condition this morning. The fire is recognized as the work of an incendiary. Franz M. Rieger appeared in the New York state census of 16 February 1892 in Niagara, New York. Other members of the household included Anna C. Rieger, Mary A. Rieger, Herman Martin Rieger and Frank J. Rieger. He was a farmer, according to the 1892 census. He married Frederike Regenhardt, daughter of Friedrich Karl Regenhardt and Rosina Plum, on 23 April 1895 in Niagara Falls, Niagara County, New York, at Sacred Heart Church. At the time of this marriage, her name was recorded as Frederike Rotger. Franz M. Rieger and Frederike Regenhardt appeared in the US federal census of 1 June 1900 in Niagara Falls, Niagara County, New York, at Lockport Road. Also in the household were Rottger step-children Clara (age 21), Martha (18) and Clarence (16), and one male farmhand. The following appeared on 6 August 1904 in The Lockport Journal: County Clerk's Transcripts (Mortgages) . . . Adam Kammerer to Frank Rieger, $1,000. The following appeared on 23 November 1904 in The Lockport Journal: County Clerk's Transcripts (Mortgages) . . . Adam Kammerer to Frank Rieger, $1,500. Franz M. Rieger and Frederike Regenhardt appeared in the New York state census of 1 June 1905 in Niagara Falls, New York, at Lockport Road. He was a farmer, according to the 1905 census. Franz M. Rieger died on 1 August 1908 at age 76 in Niagara Falls, Niagara County, New York, at his residence. Frederike Regenhardt became a widow at his death. The following appeared on 1 August 1908 in the Niagara Falls Gazette: Frank Rieger, 76 years old, died at his late residence in Sugar street near Lockport street at 11 o'clock this morning after an illness of several weeks. Mr. Rieger has been in failing health for some time. He is survived by a wife, two sons, Herman M. and Frank, of this city; three daughters, Mrs. Charles S. Braas and Mrs. Martin T. Ryan of this city, and Mrs. S. Rieger of Lockport; and one syster, Mrs. Frances Regenhardt of this city. The funeral will be held on Tuesday morning at 8:30 o'clock from the house and at 9 o'clock from the Church of the Sacred Heart. Mr. Rieger has been a resident of Niagara County for over 50 yeaars, and of this city about 40 years. Both in business and in social life he was highly regarded for his sterling worth. The following appeared on 4 August 1908 in the Niagara Falls Gazette: The funeral of Frank Reiger, who died on Saturday morning, was held from the family home at Sugar street, near Lockport street, at 8:30 o'clock this morning. Services were held from the Church of Sacred Heart at 9 o'clock, the Reverend James J. Roche officiating. The bearers were: John Flynn, Michael Fell, Henry Ochs, Anthony Rohleder, C. P. Metz and John Traverse. The bell at Sacred Heart Church was tolled at the funeral of Mr. Reiger this morning. The bell has never before been tolled at a funeral, and it was done as a mark of extraordinary respect to Mr. Reiger, who was largely responsible for the purchase of the bell. A single grave marker identifies the graves of Franz M. Rieger and Maria Karoline Regenhardt. The following appeared on 26 March 1909 in the Niagara Falls Gazette: (Notice to Creditors) Pursuant to an order of Hon. Charles Hickey, Surrogate of Niagara County, notice is hereby given, to all persons having claims or demands against the estate of Frank Rieger, late of the City of Niagara Falls, Niagara County, N. Y., deceased, to exhibit the same with the vouchers thereof, to the subscriber, the Executor of the Estate of said deceased at office of the Suspension Bridge Bottling Co., No. 831 Linwood Ave., in the City of Niagara Falls, in said Sounty, on or before the 1st day of April, 1909. Dated Sept. 24, 1908. Herman M. Rieger, Executor. Knox & Constantine, Attorneys for Executor, Niagara Falls, N. Y. The following appeared on 20 August 1929 in the Lockport Union-Jun & Journal: One of the most remarkable family gatherings in this section in many years was that of the descendants of Jacob Rieger held yesterday at the farm of Edward A. Mayer at Pekin, Mr. Mayer being a great grandson of the founder of the family. Jacob Rieger and his five children came to this country from Katzenthal, Baden, in 1854 and settled at Suspension Bridge. The five children were Boniface and Frang [sic] Rieger and Mrs. Kate Weitzman, Mrs. Elizabeth Lauer and Mrs. Frances Reagenhardt. While the original family lived at Suspension Bridge for a number of years, the descendants migrated in many places. The idea of yesterday's reunion, the first ever held by the Rieger family, originated with Mrs. Amelia Ochs of Buffalo, and the arrangements were completed by Mrs. William A. Dickenson of this city. When the last of the guests arrived at the farm it was found that there were 180 present, they having travelec in 35 automobiles. Many of the guests came from distant points and among the places represented at the reunion were Flint, Ann Arbor and Millington, Mich., Lockport, Buffalo, Dunkirk, Cohoes, Niagara Falls, Newfane, Williamsville, Tonawanda and New York City. The great family enjoyed a sumptuous meal served on three large tables on the lawn in front of the Mayer home. The various branches of the Rieger family have been substantial citizens in the communities in which they have located and today are engaged in various useful pursuits including farming, different professions and the various branches of business. A valued possession today in the family of Mr. and Mrs. Dickenson is the trunk in which Jacob Rieger brought his belongings to the United States. The following appeared in Landmarks of Niagara County, New York (1897): Frank Rieger was born at Baden, Germany, November 6, 1831, and was a son of Jacob Rieger, who immigrated to America in 1854, settling in the village of Suspension Bridge, N. Y., where he died in 1868. Frank Rieger had received his education in the common schools of his native place and upon his arrival in America in 1854 at once took up the calling of farmer at Suspension Bridge, which he has followed ever since. In 1874 he bought the present homestead farm, then consisting of 150 acres of fertile land and during the land boom of 1891 sold ninety-five acres, at twelve hundred dollars an acre. In 1862 he established a large dairy business which he still maintains, supplying all the large hotels of Niagara Falls with their dairy products. He is a thirfty and highly respectable farmer, esteemed by all with whom he has come in contact. In 1857 Mr. Rieger married Caroline Regenhardt, of Niagara Falls, and they had five children. Mrs. Rieger died June 4, 1885, and on April 25 1895, Mr. Rieger married Frederica Regenhardt, a sister of his first wife.